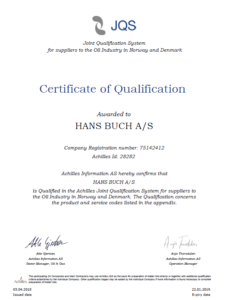 Hans Buch Marine is a division of Hans Buch with only one great passion - shipping. Located in Copenhagen and Rotterdam we support the global maritime sector with NAV/COM services and value-added supply chain. Hans Buch Marine is close to 100 years and still going strong. It has always been about Quality, Service, Safety and Environment. Want to see more from Hans Buch Marine? Here you can find a broad portfolio of high end quality brands from within electronics, technical equipment and consumables. Quality is a key element as our costumers rely on our equipment to perform when required. If you need guidance, Hans Buch A/S have a long history within the maritime business in Denmark. We have a dedicated team of sales and service people, who are always ready to help you. Oslo based Golar LNG has agreed with ERMA FIRST, to install a Ballast Water Treatment System (BWTS) on up to 16 LNG vessels. The Danish shipping company Uni-Tankers A/S has decided to use Steri-7, the innovative biocidal disinfection series from Hans Buch. 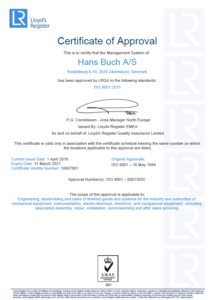 ERMA FIRST becomes the first full flow electrolysis BWTS vendor worldwide that received the USCG Type Approval. Get the latest news from the marine industry.